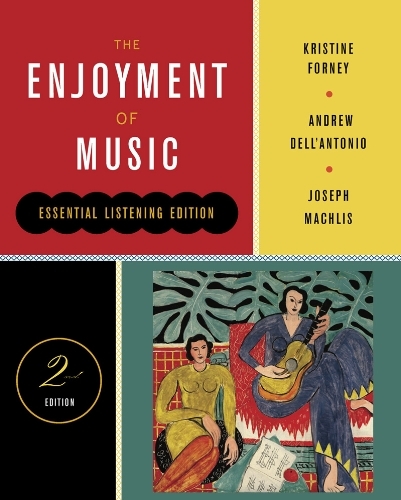 Thoroughly revised with new co-author Andrew Dell’Antonio, The Enjoyment of Music: Essential Listening Edition offers instructors the flexibility to teach their course thematically or historically, and helps students acquire a lifelong interest in music. And with Total Access, all the music and media resources students need are automatically included with every new copy of the text. Kristine Forney has been a member of the Music History/Musicology faculty at California State University, Long Beach, since 1978. She specializes in Renaissance music, is a performer and teacher of historical instruments, and is the author of numerous scholarly articles exploring diverse facets of Renaissance musical life and practices. She has taught music appreciation to thousands of undergraduate students, and has been an author of The Enjoyment of Music since 1988. Andrew Dell'Antoniois Professor in the Musicology/Ethnomusicology Division at the University of Texas at Austin, Butler School of Music. He is a former Mellon Fellow at the Harvard-Villa I Tatti Center for Italian Renaissance Studies and the editor ofBeyond Structural Listening? Postmodern Modes of Hearing(UC Press). The late Joseph Machlis was professor of music at Queens College of the City University of New York. Among his many publications are Introduction to Contemporary Music (Norton) and singing translations for many operas.